“If there’s one issue that ties climate change and conflict together in South Asia, it’s water,” said senior advisor for natural resource management at USAID’s Asia and Middle East Bureaus, Mary Melnyk. It is “fundamental to some of the existing tensions” in many conflict-affected communities and could also contribute to future tensions, she said. Changing weather patterns mean less rainfall; retreating glaciers and snowpack are already decreasing downstream flows; and monsoons are less predictable. At the same time, demand for water is growing because of increases in population and water use, particularly by industry in the region. 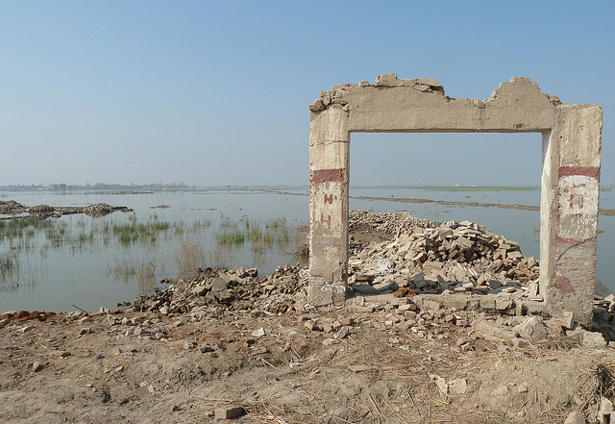 Photo Credit: “Destroyed school near Jacobabad, Pakistan, after flooding in 2010,” courtesy of the U.K. Department for International Development.